Who doesn’t have stress and anxiety? Check out today’s article by guest blogger, Santanu Majumdar, for some info on anxiety and natural remedies to alleviate it. The best way you can make your body healthy is being physical and eating right. But even then, there are several complexities that persist in life to which many do not pay much attention. One among them is chronic anxiety which is known to be in every person. But, anxiety levels differ from person to person. What does chronic anxiety mean? Firstly, chronic anxiety is a condition which happens to exist in almost every person in varying degrees. The reason for this is the various challenges that each one in the population faces. There might be some condition in a person’s life to which he/she is not ready to deal with and when it happens, you are dumb struck. You remain shocked, not able to understand how to react and get through the situation. At this stage, you face several biological reactions like increased heart palpitations, brain freezing and many more. Imagine you are watching a horror movie and suddenly you hear rustling outside the window. Imagine when you have a stage fear and out of nowhere you are called onto the stage without any prior preparation, you are asked to deliver a speech. What is going to be your reaction? Of course everything in life happens for the first time but, here the discussion is about the unwanted and challenging situations which causes severe fear-based reactions, mentally and physically. Here, you need to reconcile fast and if you fail, you enter into the condition of chronic anxiety. You might be aware of the fact that life is unpredictable and no one can know what will happen in their near future. They say, “An ounce of prevention is worth a pound of cure.” It is better to get prepared even before a problem arises. 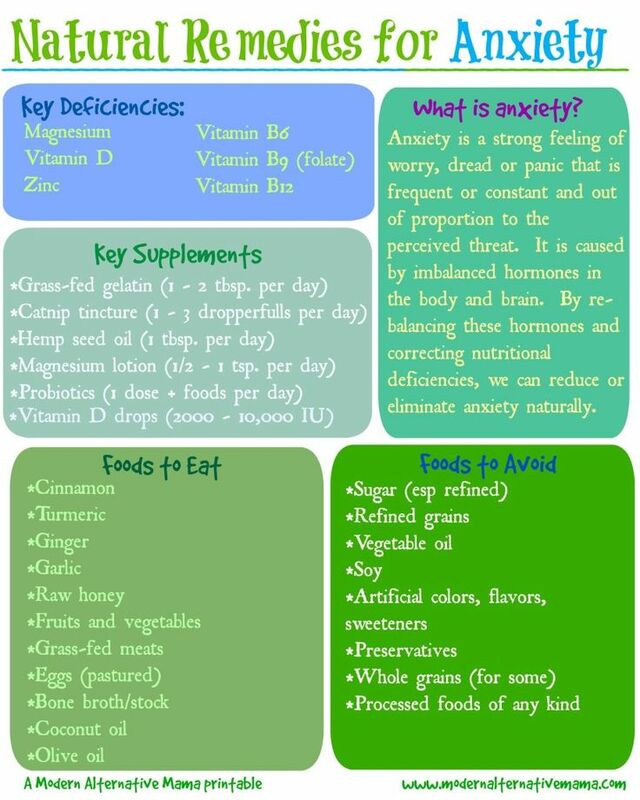 So, here the natural remedies for anxiety comes as a savior to prepare you to fight against the difficult stages which in a way hampers your body. The main constituent in these natural remedies are the natural herbs which are targeted to specific organs. For anxiety one of the main herbs is the chamomile which is quite relaxing and soothing when used. This is why they are often mixed in tea packets. They have several health benefits. Insomnia and chronic anxiety is dealt with another herb from Europe named as St. John’s Wort. It has a mild side effect as according to some complaints but many people ignore this and continue using this. A common complaint about the side-effects of prescription drugs for reducing anxiety is weight gain. There are certainly many more detrimental side effects attached to using these prescribed medicines and hence people ultimately rely on the natural remedies for anxiety. There are several companies who manufacture these remedial products but you must only select those products which have high reputation and which herbal doctors prescribe. You can start with the companies’ websites to read more on the ingredients of their products before you make a decision. And, of course, performing research about those products from trusted sources who do not endorse said products, is always a good idea. Santanu Majumdar is a part-time blogger and currently blogs at healthresource4u.com. He is also a health and fitness lover who loves to share her ideas on health, fitness and beauty. You can check him out on Twitter and Facebook. Do you use any effective natural remedies to fight stress and anxiety?